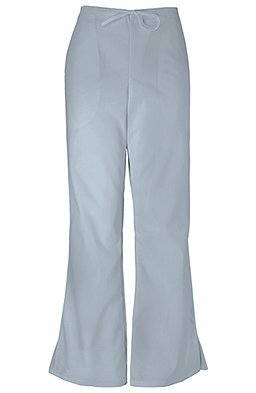 Comfortable and durable these Cherokee Workwear Originals scrub pants have a natural-rise waist with front drawstring and back elastic for a perfect fit. For extra ease there are additional inches at the waist. You must use the drawstring to make the waist match standard waist measurements or adjust for a slightly tighter or looser fit depending on your preference. The flared legs feature side vents. There are front slash pockets and one back patch pocket. Missy modern classic fit Natural-rise scrub pants Front drawstring back elastic waist Flared legs with side vents Front slash pockets one back patch pocket Soil-release 65% poly/35% cotton poplin Total inseam approximately: 31" Regular 28½" Petite and 34" Tall This product can be shipped anywhere in the 50 United States Puerto Rico The US Virgin Islands and APO and FPO addresses. Sorry we cannot ship this product to any other address.